Your Heart Knows the Way Home. 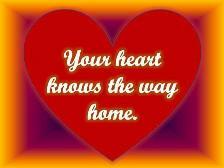 "Your Heart Knows the Way Home"
as a 5th Dimensional Being. are available for listening and purchase. - 30 to 60 minutes. began Sun, March 10, 2019. Spiritual Ascension is far from an easy experience. Get help to navigate the path of transformation. lives your Divine Self, waiting to assist you. the blessings of your Heart. All calls will be recorded for online listening. and you must CONFIRM to join the list.